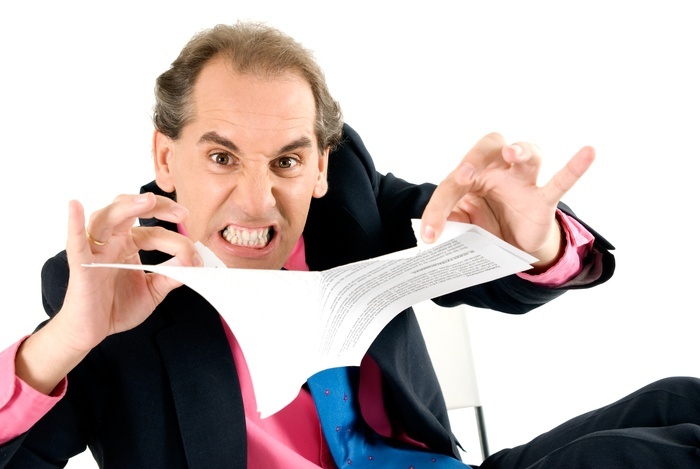 These are undisputed ways to know a bad boss. If you are an employee and you want to know if your boss is bad, then go through and explore this list of 35 undisputed ways to know a bad boss. Put a tick beside any of the behaviours frequently displayed by your boss. More ticks signify that you indeed have a bad boss. There are various undisputed ways to know a bad boss. Ideally, in the workplace, we would all have competent and great bosses who would make us feel valued and help us to win or succeed. Unfortunately, that’s not always the case. Candidly, most people have experienced bad bosses in the workplace. Being saddled with a terrible boss at work can quickly turn a dream job into a nightmare. Nothing has more power to turn a good work situation bad than having a bad boss. Sadly there are lots of bad bosses floating around in the workplace. A recent British study accused 1 in 4 bosses of being bad, while a Norwegian study alleged 1 in 5. That is a scary thought! As we all know, not every boss is that great symbol of managerial perfection that one would hope for at work. However, what are the undisputed ways to know a bad boss? As more employees consider themselves stuck with a bad boss at work, it is important to note that many employees too jump to conclusion and quickly label their boss ‘bad’, especially if their boss is the ‘no-nonsense’ strict type. However, a tough or strict manager must not be seen as incompetent or bad. 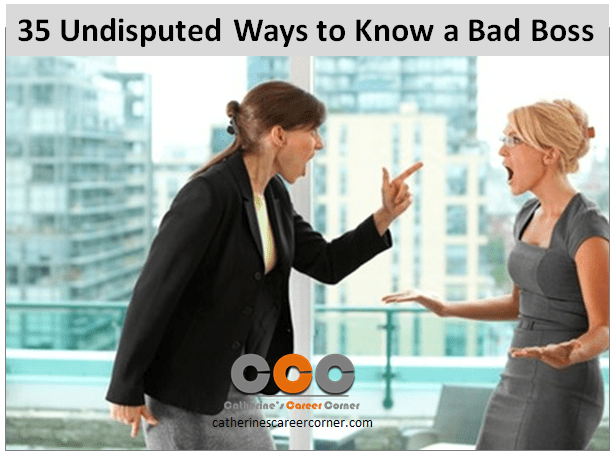 The undisputed ways to know a bad boss as discussed in this post will let you know if your boss is bad or simply strict. If you are unhappy, miserable or plan to quit your job because you think you have a bad boss, it is important to explore these 35 undisputed ways to know a bad boss to indeed know if your boss is truly bad. 3. Says he’s too busy to communicate or insinuates that everything is confidential. 11. Hates to change anything! After going through our list, 35 undisputed ways to know a bad boss, we have to remind you that there are three categories of these undisputed bad bosses. So, my question to you is, which category does your undisputed bad boss fall into? 1. Doesn’t know he/she’s bad. 2. Knows he/she’s bad and wants to improve. 3. Doesn’t want to know if he/she’s bad or doesn’t care. Most bosses who make their employees unhappy are simply unaware because nobody has ever told them. Some bosses know that what they are doing is wrong and are trying to improve. If this is your boss, he/she may need your support and that of the whole team in order to do better. There’s also the third category of bad bosses. They are those who unwavering refuse to acknowledge that they’re bad bosses. These types of bosses celebrate the fact that they make people unhappy at work. These types of bosses are usually beyond helping and may never learn and improve. You should expect to be safe from physical, emotional, and verbal abuse at work. If you truly have a bad boss, ensure that you’re never alone with him or her. You need your colleagues around you in front of whom he or she will have to behave or not. If you have a bad boss, you are not alone. According to workplace researchers Beverly Kaye and Sharon Jordan-Evans, when people quit, they don’t leave a company, they leave a bad boss. Surveys show that up to 75% of employees who leave their jobs do so at least in part because of their boss. To reduce the stress caused by a bad boss at work, keep your cool around your boss; get distracted by engaging with other colleagues and keep things in perspective. Have a mentor in the organisation; go for mentoring once in a month and take a walk at lunch or do other interesting things to offset the drudgery of having to deal with a bad boss. If your personal life, health, and capacity to perform at work are suffering, seriously consider moving to another department. You can do a job secondment or remove yourself from the bad boss. If all else fails, look for another job. Your health and happiness are more important than sticking it out with a bad boss. Do you have any other undisputed ways to know a bad boss? If you do, please share them with us by adding your comments below. Great article. Thanks for confirming that my boss needs to work on his leadership skills.